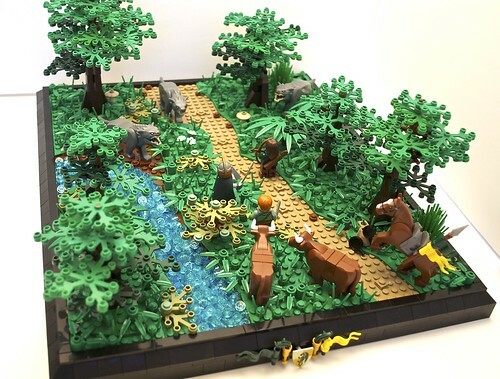 In this MOC, Sir Caelan Munro, his archer Tavish and squire Sholto have encountered a pack of Northern Grays on a quiet forest path while on their way to returning some stolen cattle. These cows are badly needed by the small village of Madeg to get through the coming winter. I like the river sides. Also, I envy your Wargs. You did a great job on this! I love the pathway and foliage as well as the lovely stream. Those wolves would sure be a fearsome creature to encounter in the wild. I'll be keeping my eye out for them. Loving this whole scene. 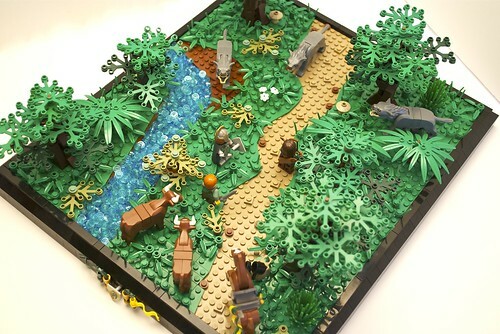 The placement of the wolves is excellent, and I'm digging the way you've done the river bank. Can't wait to see more MOC's from you! "This is how wars are won - not with vast armies, nor courageous hero's, but with a single knife blade, artfully placed." Location: Captured during the Coronation. 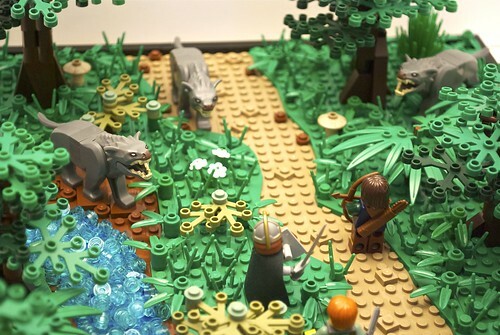 Nice use of the wargs, I'm going to have to do a build with mine sometime. That path looks almost manicured in some spots, I'll have to remember the curved green plates if I ever get into building town. Thanks for that little piece of inspiration! Outstanding job! I envy your Wargs. LettuceBrick wrote: I like the river sides. Also, I envy your Wargs. Thank you, these Wargs are going to be great for LCC. Sir Ronald wrote: You did a great job on this! I love the pathway and foliage as well as the lovely stream. Thank you Ronald! I hope to build a third here soon following their return to Madegg. I'm calling it "My Bovine Trilogy"
pyro guy wrote: Loving this whole scene. The placement of the wolves is excellent, and I'm digging the way you've done the river bank. Can't wait to see more MOC's from you! Crazycrownieguy wrote: Nice use of the wargs, I'm going to have to do a build with mine sometime. Absolutely! Maybe Garheim can take the white ones? mrcp6d wrote: That path looks almost manicured in some spots, I'll have to remember the curved green plates if I ever get into building town. Thanks for that little piece of inspiration! Great to hear; yeah the wedge plates are expensive but worth it. Justin M wrote: Outstanding job! I envy your Wargs. Hey great build man! I've gotta look for good use of those wargs somewhere... hmm.